Candor International School aims to nurture lifelong learners, who, through respect, intercultural understanding, technology, creativity, collaboration and an active engagement in community service and humanitarian activities, become citizens of the world to contribute, and make a difference, to their generation. Candor is an authorized IB world school which has been designed to ensure the delivery of an effective Diploma Programme with potential for meaningful community service projects. Candor’s organic farm provides opportunities for environmental science and other IB projects, including CAS. Dedicated, competent and experienced teachers offer several IBDP courses to students from many nationalities. The school also integrates Pre-SAT and SAT preparations for high school students through a College Advisory Service and an experienced in-house college counselor who interacts with both students and parents. The international Baccalaureate aims to develop inquisitive, knowledgeable and caring young people who will help create a better and more peaceful world through intercultural understanding and respect. IBDP students must choose one subject from each of the six groups (1 to 6), ensuring breadth of knowledge and understanding in their most proficient language, additional language(s), the social sciences, the experimental sciences and mathematics. Student may choose either an arts subject from group 6, or a second subject from groups 1 to 5. At least three and not more than four subjects are taken at higher level (240 teaching hours), while the other subjects are taken at standard level (150 teaching hours). Students can study and take examinations in English, French or Spanish. In addition to disciplinary and interdisciplinary studies, the Diploma Programme features three core elements that broadens students’ educational experience and challenges them to apply their knowledge and skills. Theory of knowledge develops a coherent approach to learning that unifies the academic disciplines. This course on critical thinking inquires into the nature of knowing and deepens the understanding of knowledge as a human construction. Creativity, action, service (CAS) involves students in a range of activities alongside their academic studies throughout the Diploma Programme. The three strands of CAS enhance students’ personal and interpersonal development through experiential learning and enable journeys of self- discovery. Students take written examinations at the end of the programme, which are marked by external IB examiners. Students also complete internal assessment tasks in school. These are either initially marked by teachers and then moderated by external moderators or sent directly to external examiners. The marks awarded for each course range from 1 (lowest) to 7 (highest). Students can also be awarded up to three additional points for their combined results on theory of knowledge and the extended essay. 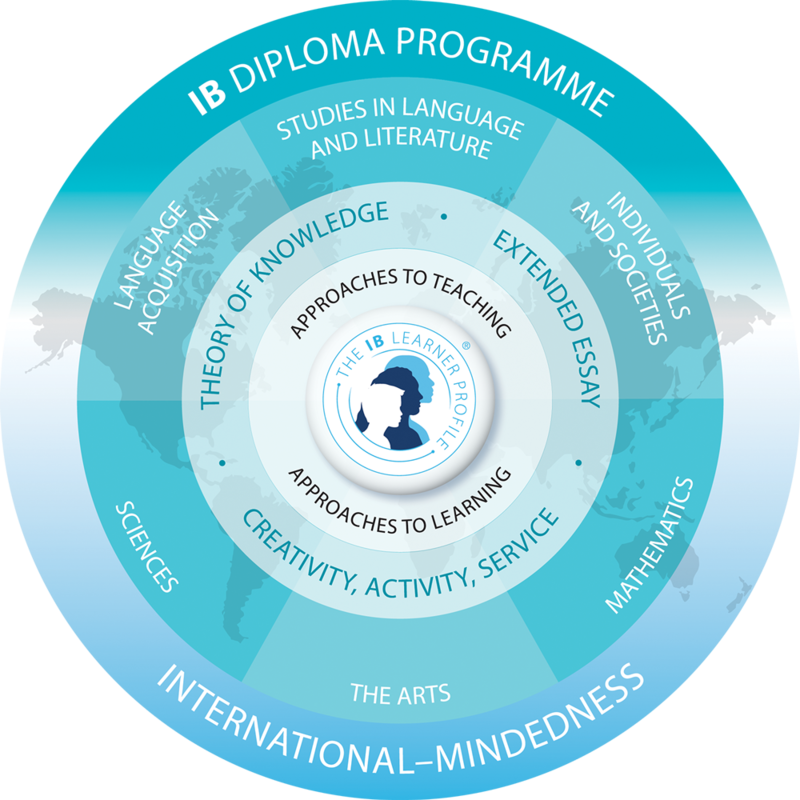 Minimum of 24 points must be gained to be awarded the IB diploma, this being subject to certain minimum levels of performance across the whole programme and to satisfactory participation in the creativity, action, and service requirement. The highest total that a Diploma Programme student can be awarded is 45 points. Standard level (SL) courses require rigorous study leading to a breadth of knowledge. Higher level (HL) courses require intensive study leading to mastery. All students in the IB Diploma Programme take a combination of SL and HL courses. Language A: literature (SL/HL): Literature course introduces students to the analysis of literary texts. The course is organized into four parts, each focused on a group of literary works. Language A: Language and literature (SL/HL): The language A: language and literature course introduces the critical study and interpretation of written and spoken texts from a wide range of literary and non- literary genres. Language ab initio courses are for beginners, i.e. students who have little or no previous experience of learning the language they have chosen. Language B courses are intended for students who have had some previous experience of learning the language. Business and management (SL/HL): The Diploma Programme Business and Management course is designed to develop an understanding of business theory, as well as an ability to apply business principles, practices and skills. Economics: The course emphasizes the economic theories of microeconomics, which deal with economic variables affecting individuals, firms and markets, and the economic theories of macro-economics, which deal with economic variables affecting countries, governments and societies. Information Technology in a Global Society (ITGS) (SL/HL): The ITGS framework is modelled on a ‘triangle’. It uses an integrated approach, encouraging students to make informed judgments and decisions about the role of information and communication technologies in contemporary society. Psychology (SL/HL): The IB Diploma Programme psychology course is the systematic study of behavior and mental processes. The psychology course examines the interaction of biological, cognitive and sociocultural influences on human behavior. Biology (SL/HL), Chemistry (SL/HL), Physics (SL/HL): Through studying biology, chemistry, and physics, students should become aware of how scientists work and communicate with each other. There is an emphasis on a practical approach through experimental work. Environmental systems and societies: Through studying environmental systems and societies (ES&S) students will be provided with a coherent perspective of the interrelationships between environmental systems and societies; one that enables them to adopt an informed personal response to the wide range of pressing environmental issues that they will inevitably come to face. Mathematics (Studies/SL/HL): These courses are designed for different types of students: those who wish to study mathematics in depth, either as a subject in its own right or to pursue their interests in areas related to mathematics; those who wish to gain a degree of understanding and competence to better understand their approach to other subjects; and those who may not as yet be aware how mathematics may be relevant to their studies and in their daily lives. Why do Universities Value IB Students? IB students are prepared for academic success. Participation in the IB Diploma Programme shows that students have excelled in multiple and diverse academic challenges which is a strong predictor for success at university level. Universities around the world say IB students are ‘Well Prepared’. In a survey of 150 university faculty and admissions staff from the UK, the IB Diploma programme was rated higher than other qualifications based on the breadth of the curriculum; development of critical thinking, time management and communication skills; and motivation of the students. Similarly, a survey of 160 university faculty and admissions staff from Australia and New Zealand showed that 77% of respondents indicated that the IB Diploma Programme prepares students well for university.